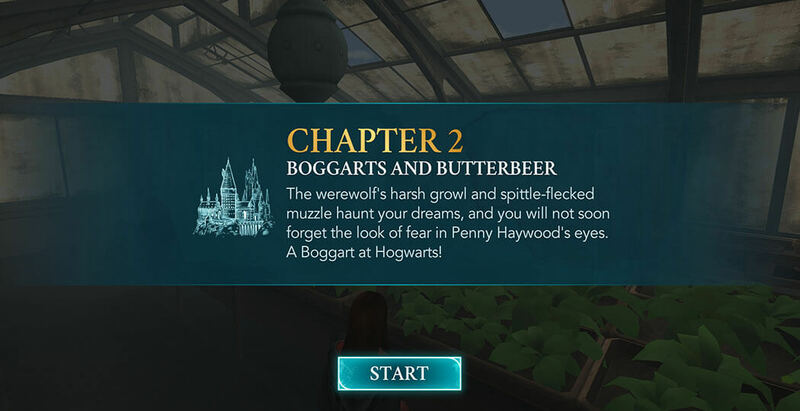 Hello everyone, welcome to Chapter Two of Year Three of our Magical Journey Walkthrough for Harry Potter: Hogwarts Mystery. 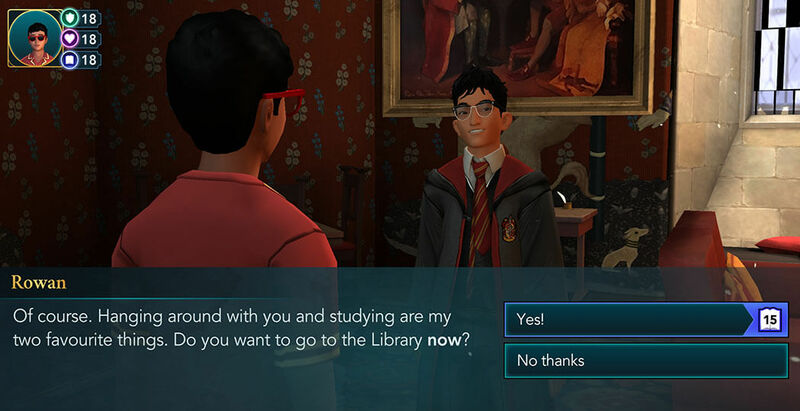 In the previous chapter, you came back to Hogwarts after the summer holidays. You attended the welcoming ceremony and learned that from now on, any student caught investigating the Cursed Vaults will take severe consequences. 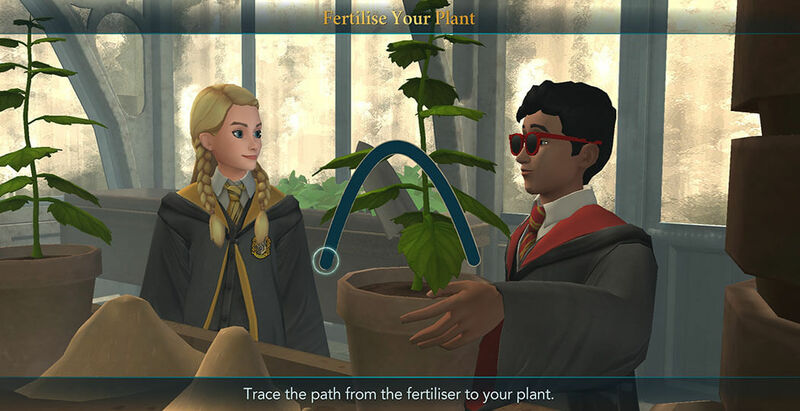 Also, you attended your first classes for the year – Flying and Herbology. 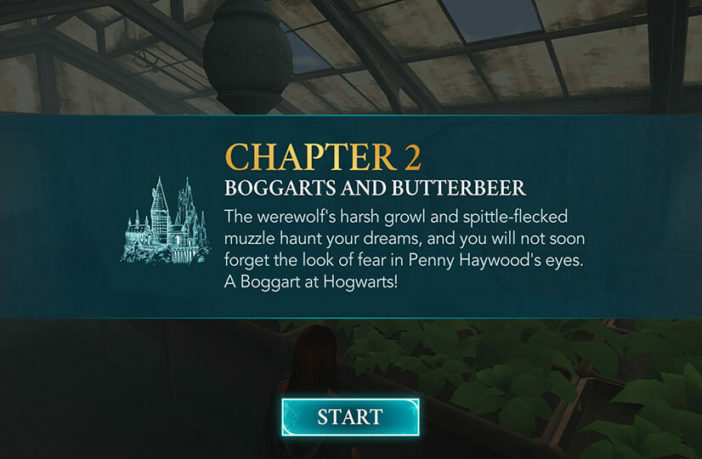 Near the end of the later class, Penny was attacked by a Boggart which assumed the form of a werewolf. Thankfully, Professor Sprout was quick to act and save your friend. It is recommended to focus on completing the lessons part of the chapter first. 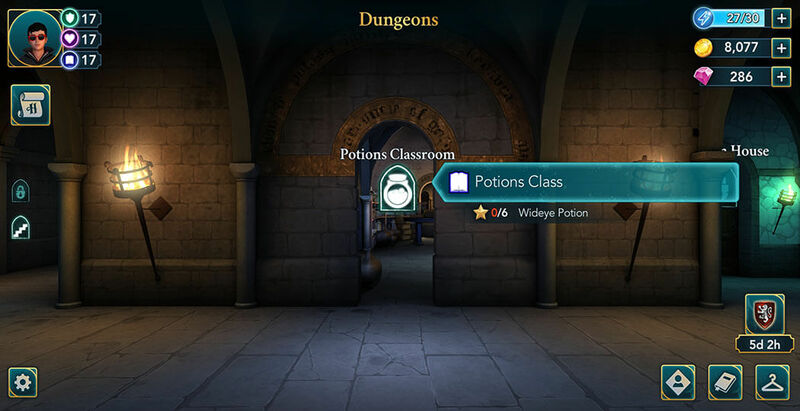 Hit the GO button and proceed to the Potions Classroom. 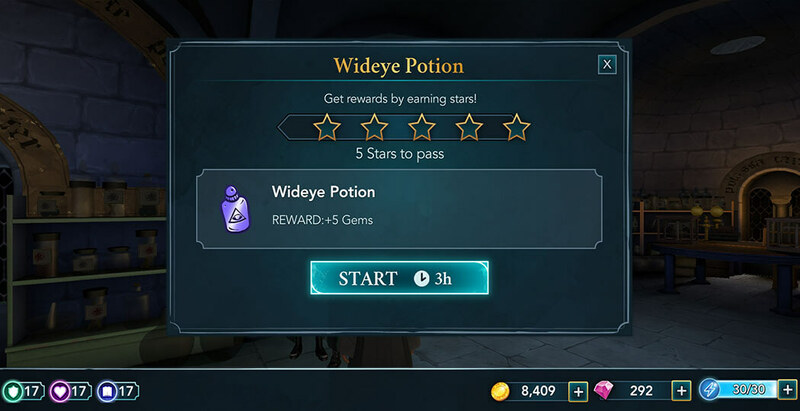 Unlocking the Wideye Potion lesson requires you to earn a total of six stars from Potions Class. You can do this in several different ways. The fastest way is to do three one-hour classes, but it is the least rewarding method. The slowest one, and by far the most rewarding is by completing two eight-hour classes. The somewhat balanced option includes doing two three-hour classes. In any case, when you make up your mind, hit the Start button to begin. Complete these classes just like any others so far – tap on the glowing objects in order to complete actions. This will fill up the star meter and earn you stars in return. Pay attention to the mini-tasks since completing each of those successfully will award you with ten Knowledge points. 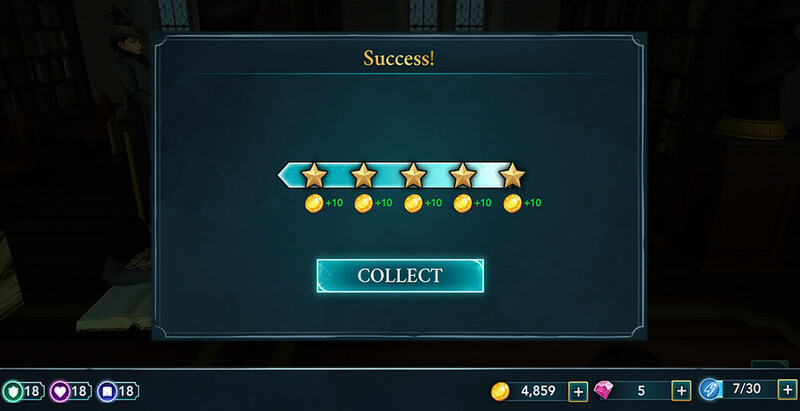 After you are done, hit the Collect button to continue. 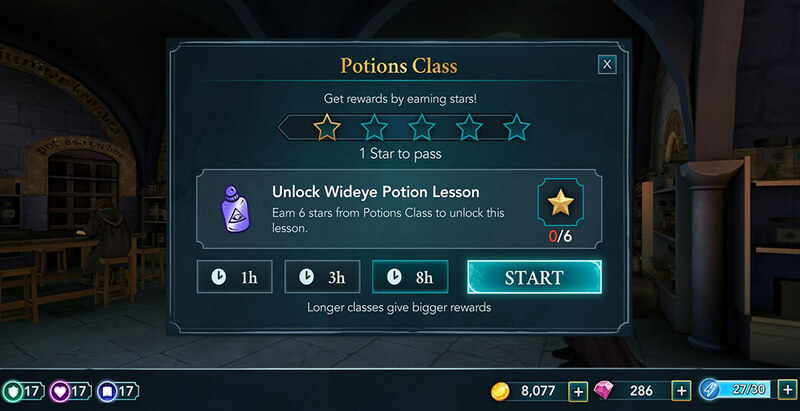 Now that the Wideye Potion lesson is unlocked, you can head back to the Potions Classroom to attend it. 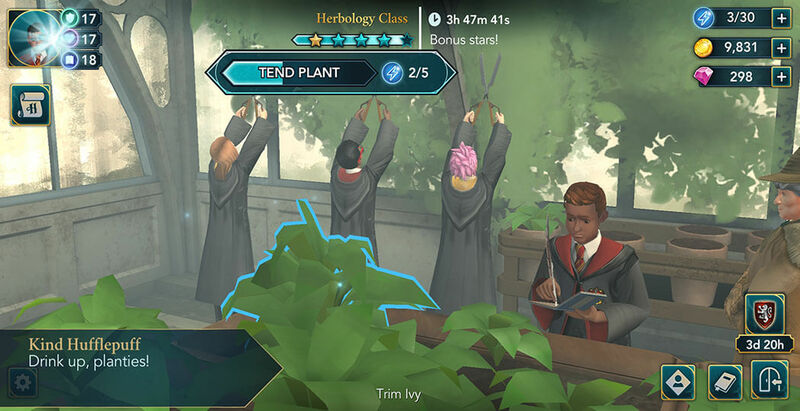 When you get there, you will see Merula standing there, accompanied by two other Slytherin students. You can tap on their speech bubbles if you are curious to find out what they have to say to you. After talking to Merula for a while, you will find out that she is still obsessed with finding the Cursed Vaults. 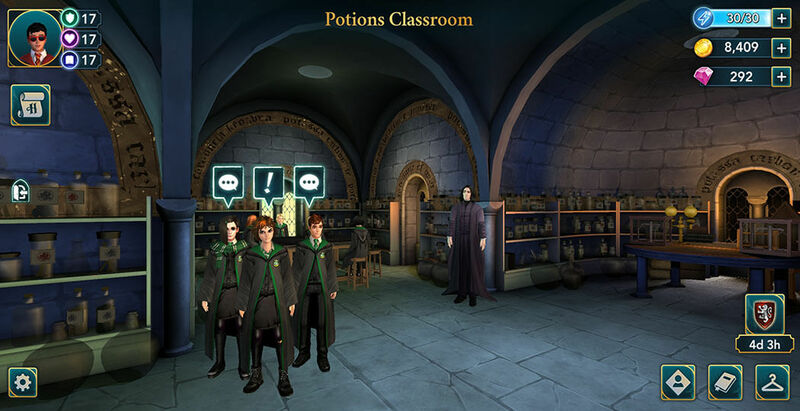 Not long after that, Snape will ask everyone to take their seats as the class is about to start. Completing this lesson will require of you to earn five stars within three hours. It shouldn’t be difficult as long as you start with full energy. Follow the same steps you took in the classes above and you shouldn’t have any problem completing this lesson in time. 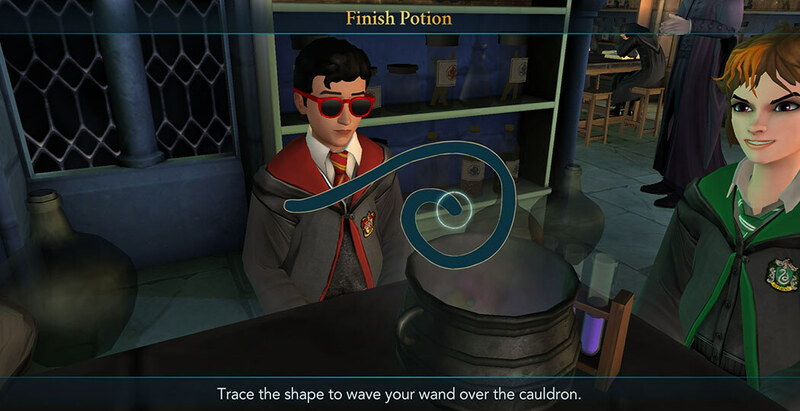 And once you have all five stars, trace the wand movement on the screen in order to complete your potion. With this, the lesson will be complete. Hit the Collect button to claim your rewards and continue. 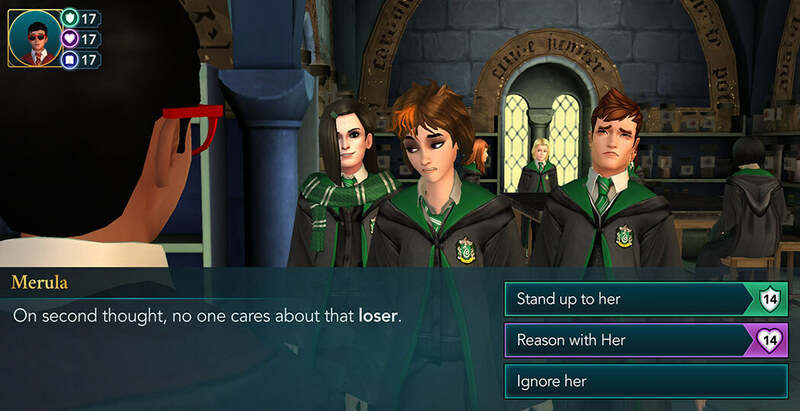 Merula and her associates will approach you and she will start acting like her old self – throwing around threats and insults. She will even go as far as to mention your brother again. You can respond to that in three different ways. 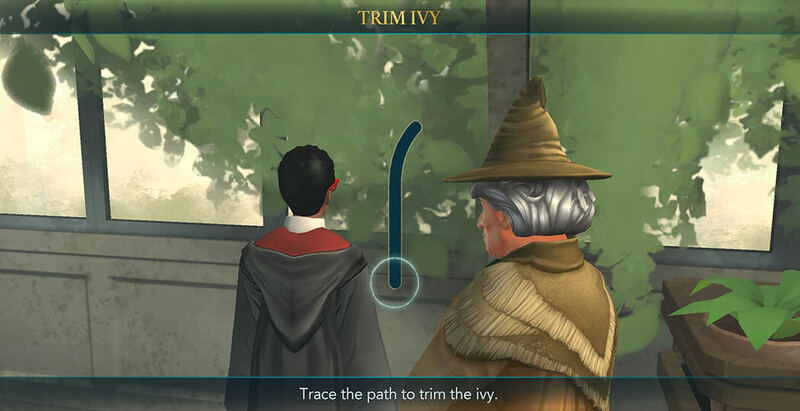 It is recommended to select either first or the second option since those will award you with ten attribute points, compared to the third option which only awards five. Keep in mind that those responses require you to have level fourteen Courage and Empathy respectively. 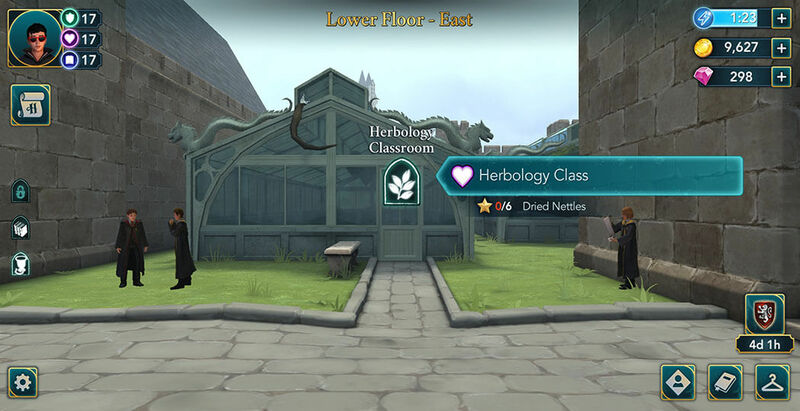 After a bit more talking, you can go to the Herbology Classroom and attend your second lesson for this chapter. To unlock the Dried Nettles lesson, a total of six stars from Herbology Class is required. 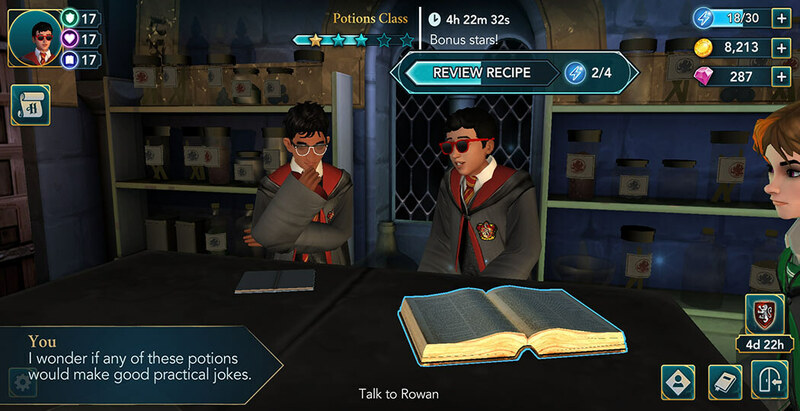 You can do the same combination of classes like you did with the Potions lesson. When you decide which class to take, hit the Start button to begin. There is not much of a difference between these classes and the ones you had before. Simply follow the same steps and you should be done in no time. 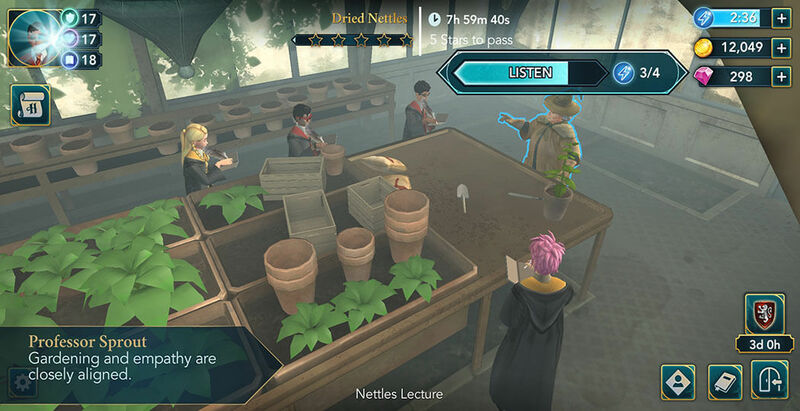 Once you complete these classes, tap on the Collect button to continue. 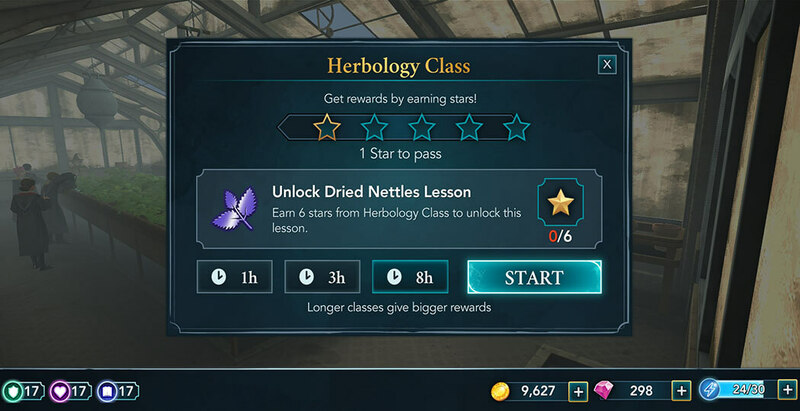 Now that you’ve unlocked the Dried Nettles lesson, you can return to the Herbology Classroom to attend it. Completing this lesson requires you to earn five stars within three hours. Because of this, it is somewhat recommended to have full energy prior to starting it. Do this lesson in the same manner as the classes you did beforehand and you will be done quickly and easily. 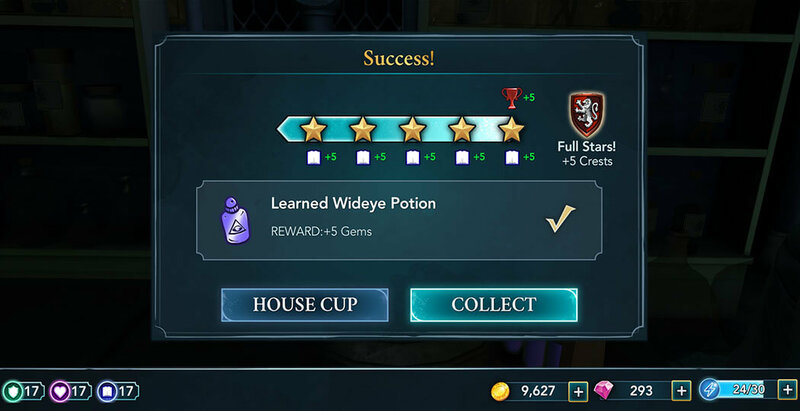 And as always, focus on the mini-tasks to maximize the number of attribute points you gain. 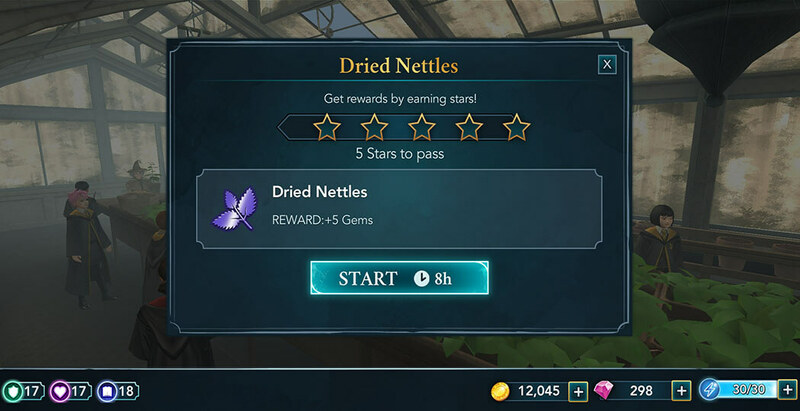 Once you obtain all five stars, it is time to fertilize your plant. Trace the path on the screen in order to complete this. Now that you’re done with the lessons part of the chapter, you can continue the story part. 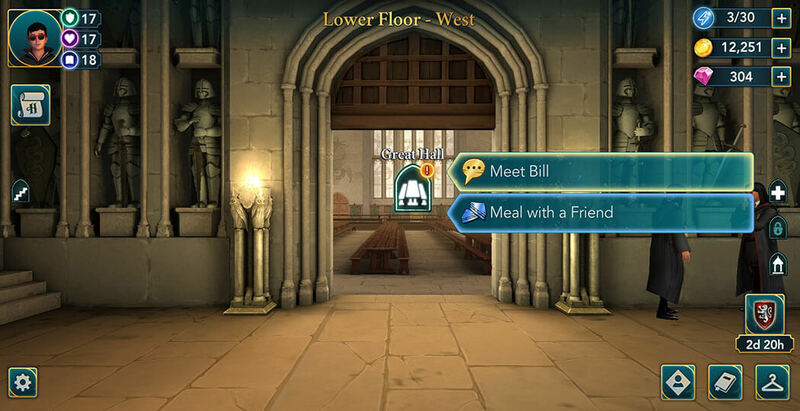 Hit the GO button and proceed to the Great Hall. You will notice Penny and Bill standing there and talking. Tap on the exclamation mark to join their conversation. After talking with them for a while, you will find out that Bill was appointed as the new Gryffindor Prefect. 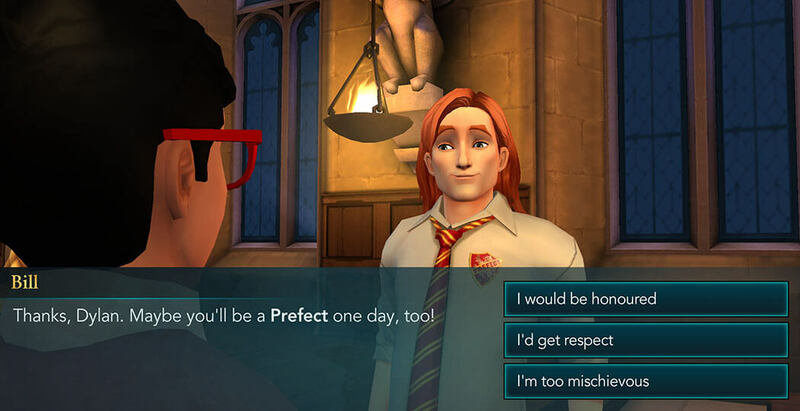 He’ll even say that one day, you could become a Prefect as well. You have three options to respond with. Each of those choices will award you with five points in a different attribute, but generally, the outcome will pretty much be the same, so pick whichever option you prefer. After talking for a bit longer, Bill will advise you to seek Hagrid regarding the Boggart situation. There is a three-hours waiting period before you can continue. You can wait for a while or use some gems to speed up the process. 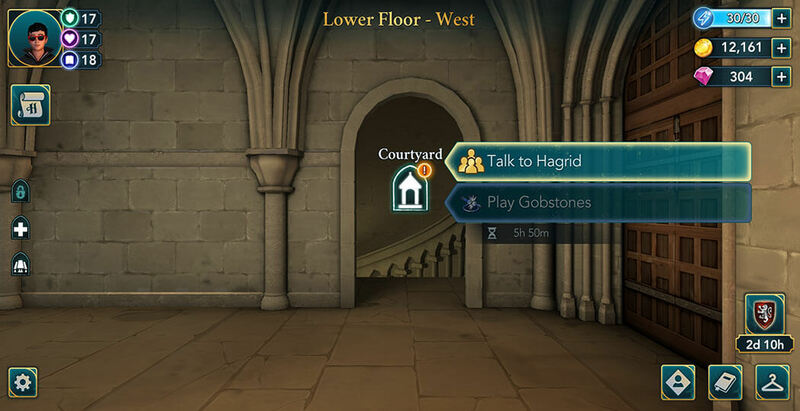 Either way, when you are able to proceed, go to the Courtyard to meet Hagrid. Once you arrive, you can check out what some of the students have to say by tapping on their speech bubbles. 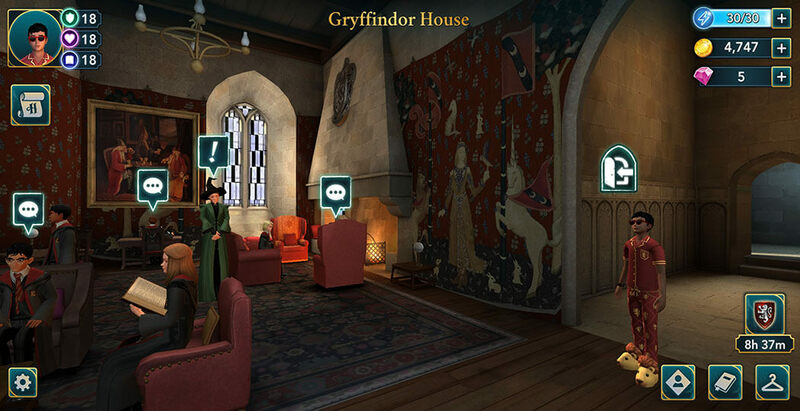 After that, you can initiate the conversation with Hagrid by tapping on the exclamation mark above him. He will ask you to advise him about the Flobberworms he raised during the summer. 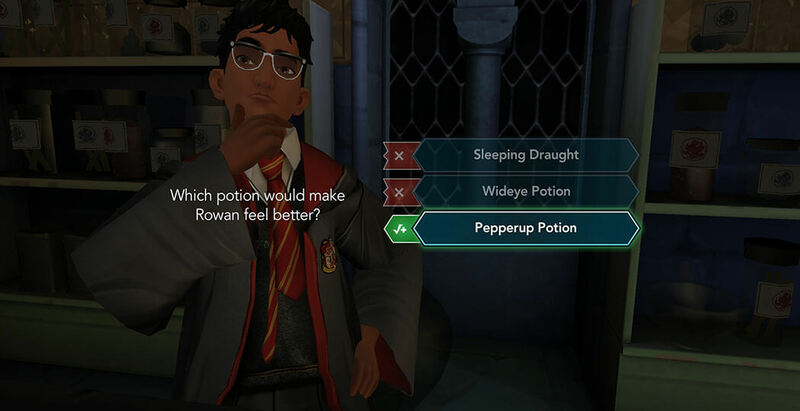 You can select one of the three options. There is not much of a difference between those choices since none of them affects the story in any meaningful way. However, some of those options can lead to pretty hilarious lines of dialogue, so you might want to consider checking it out. 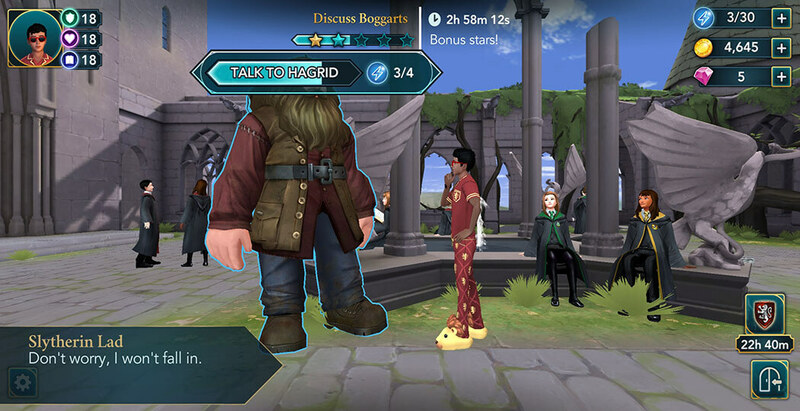 After talking to Hagrid for a while longer, you’ll get the task to discuss Boggarts with him. 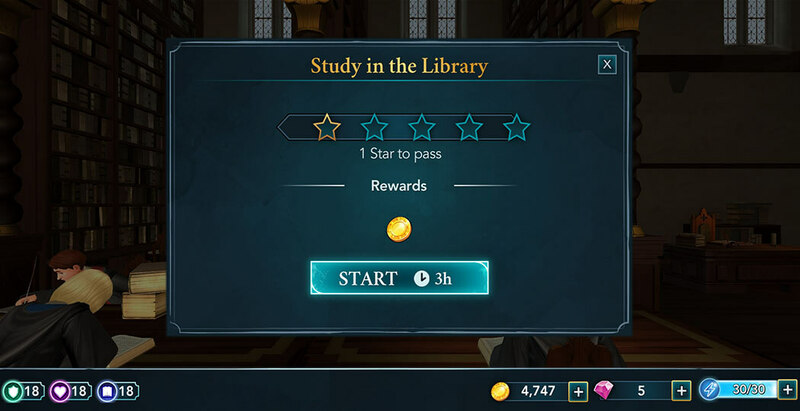 Completing it requires you to earn five stars within three hours with one star being required to pass. Do this like any other story task so far, and you shouldn’t have any problems. Once you are done with this task, you will find out that Jacob considered the possibility there is a connection between Boggarts and one of the Cursed Vaults. 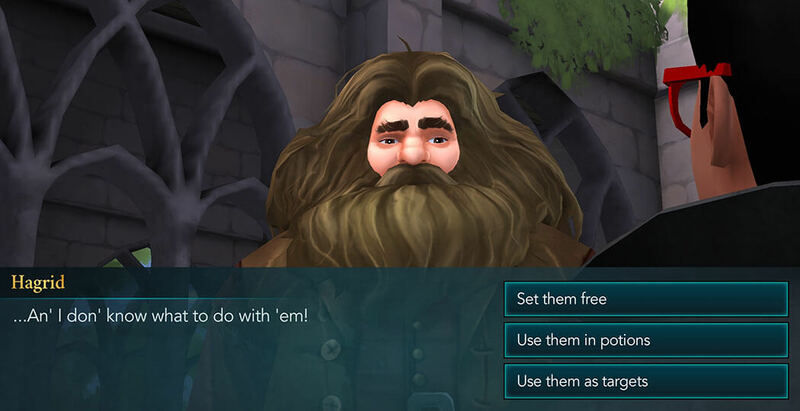 He’ll also tell you that your brother used to hang out a lot in the Three Broomsticks in Hogsmeade. Luckily, you should be able to visit it soon. 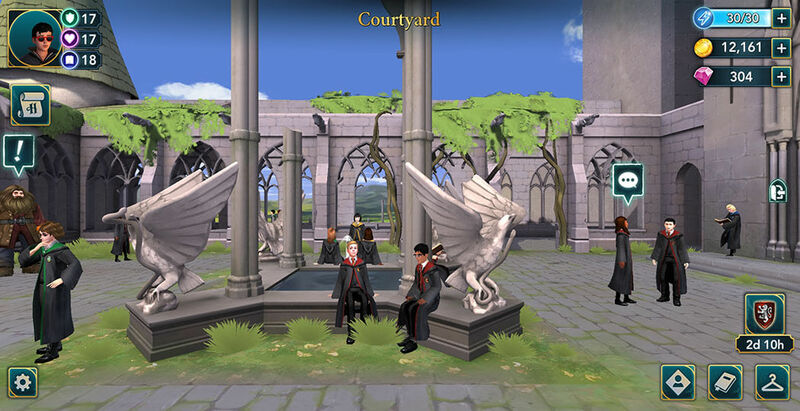 Your next task will be to talk to your Head of House about the trip to Hogsmeade. There is, however, eight hours of waiting time before you can move on. Either wait for a while or use some gems to speed it up. 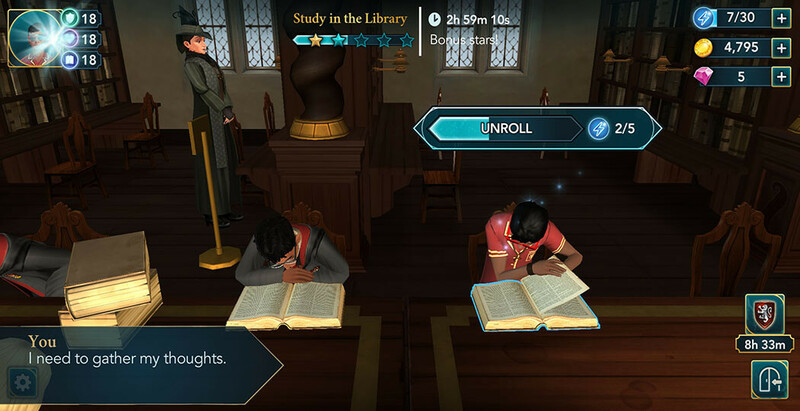 When you are able to continue, hit the GO button and proceed to your Common Room. Once you arrive, you’ll notice that some of the students have speech bubbles above them. Tap on those if you are interested to see what they have to say. 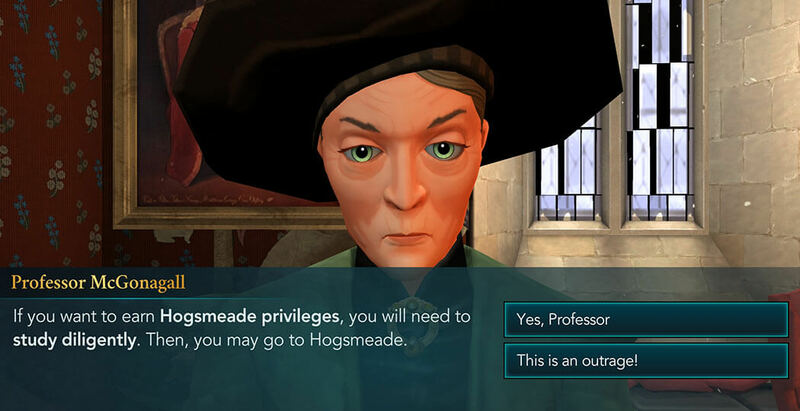 When you are done with that, talk to the Head of your House regarding the trip to Hogsmeade. After discussing it for a while, you will find out that you cannot go there until you study diligently to earn that privilege. You can react to that in two ways. 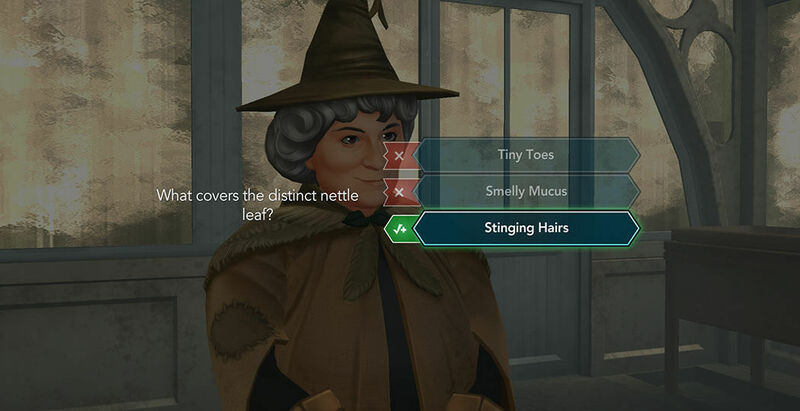 Sadly, no matter what you select, you will have to study if you want to go on a trip to Hogsmeade. Rowan will advise you to go to the library and study there. He’ll also agree to help you study and ask if you want to go now. You have two options to respond with. Picking the first option is preferable if your Knowledge level is fifteen or higher. Hit the GO button and proceed to the library. Once you are there, you’ll see the speech bubbles above some of the characters. Tap on them if you want to see what they have to say to you. 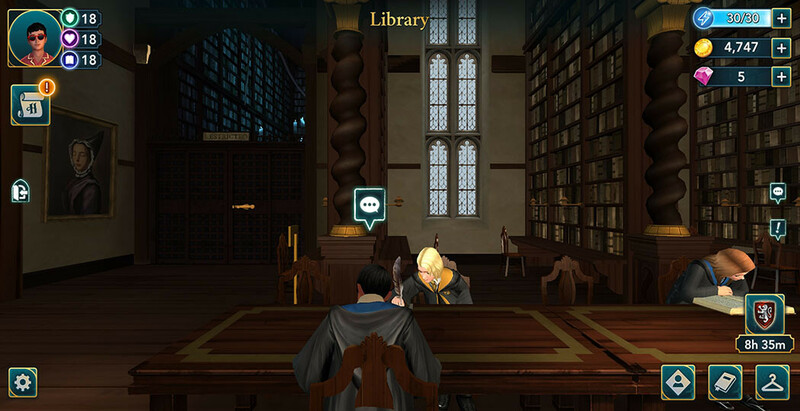 After talking to Rowan for a while, you will receive the task to study in the library. 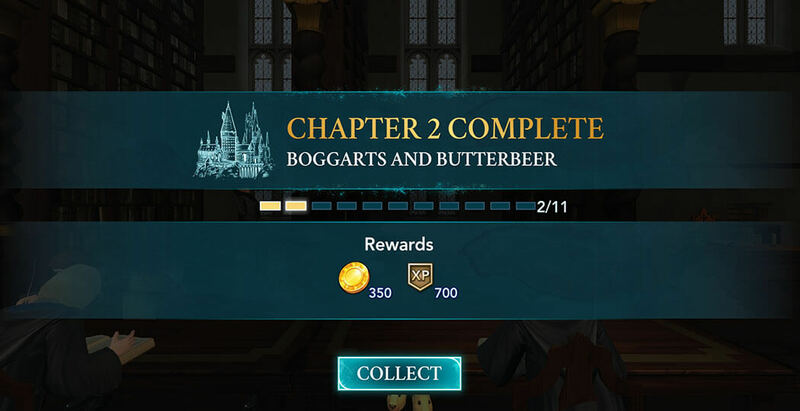 Completing it requires you to earn five stars within three hours. Since only one star is needed to pass, it should be too difficult to do this. 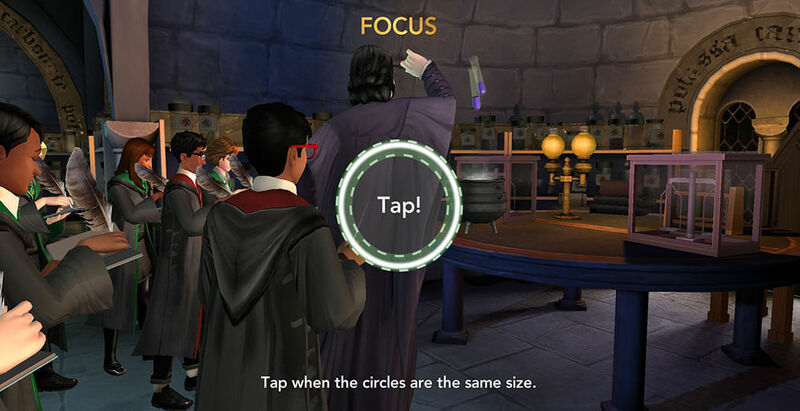 Like usual, tap on the glowing objects in order to complete various actions. This will fill up the star meter and earn you stars. 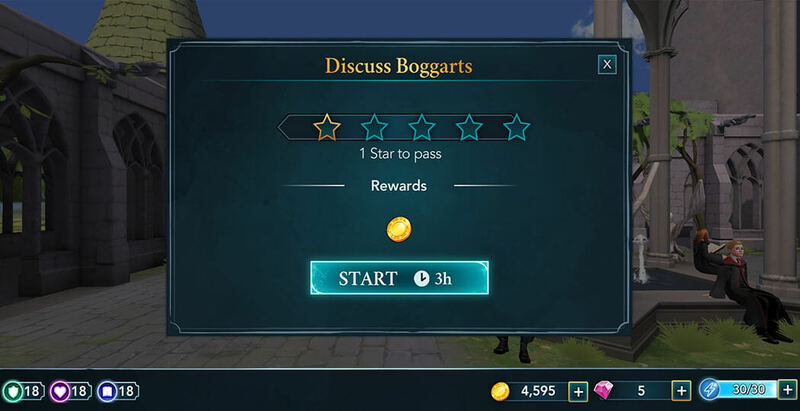 Once you earn all five stars, hit the Collect button to continue. 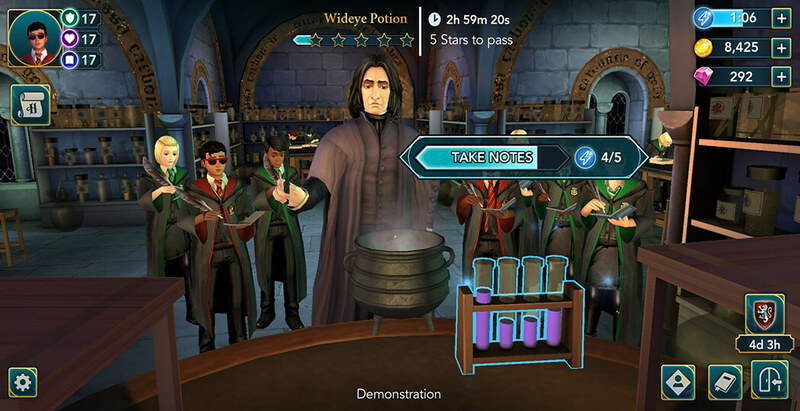 Hopefully, all this studying will prove useful and you’ll be allowed to visit Hogsmeade soon. This will conclude the second chapter of Year Three of your adventure. Tap on the Collect button to claim your rewards. Two down, nine to go! How did you like this chapter? What were your favorite moments? Which choices did you make? Let us know in the comments below.